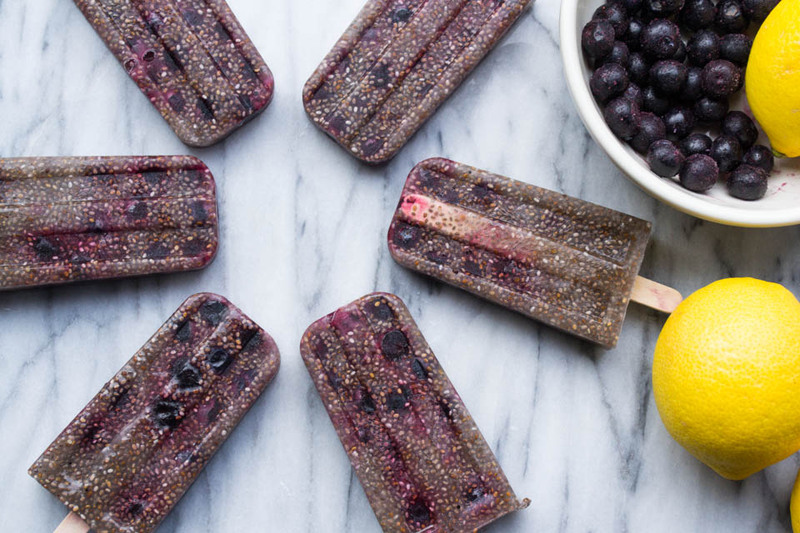 Blueberry Chia Popsicles are a refreshing treat on a warm sunny day or just a mildly sweet cool pleasure when you want to satisfy your sweet tooth. I love popsicles because they are relatively small and if you limit yourself to just one, then the serving size is dessert in moderation. 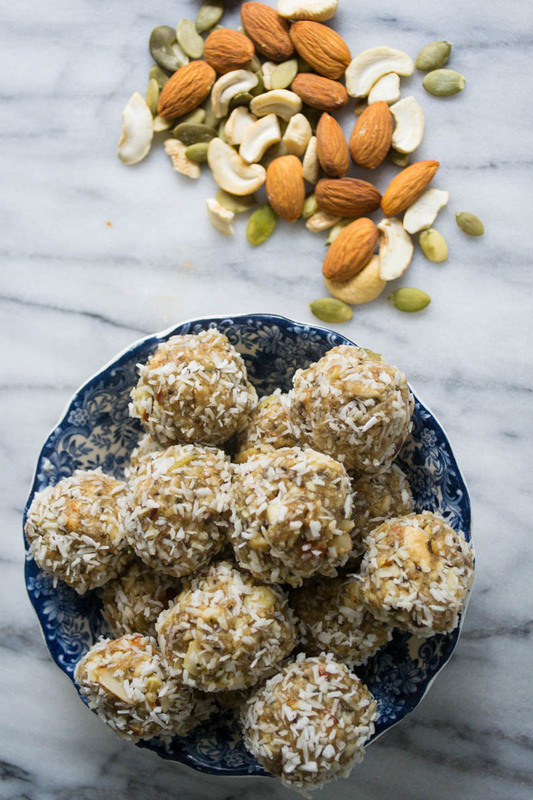 Serving size is important to keep in mind when you are trying to keep your weight in check. 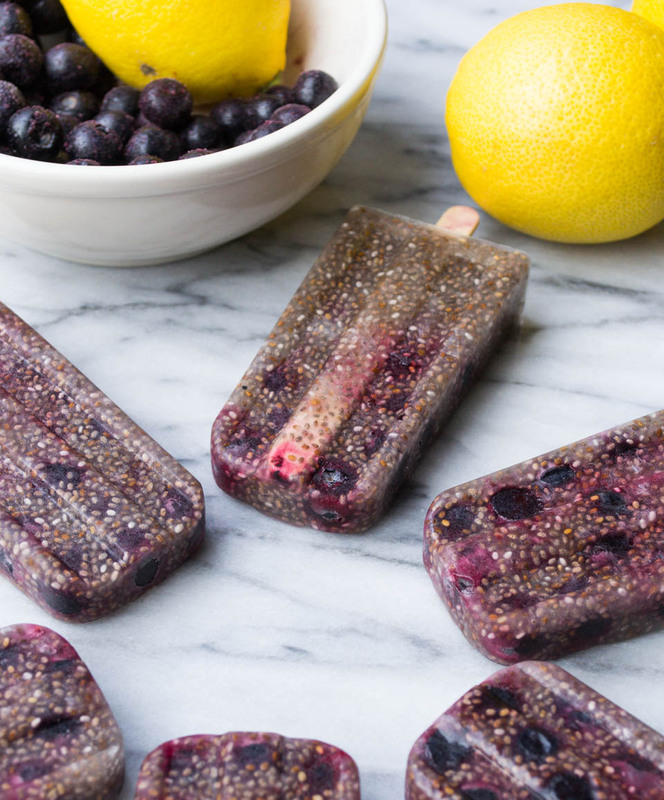 It’s ok to allow yourself a (sweet treat) periodically and having a limited portion such as a popsicle rather than a carton of ice cream where you might be tempted to have more or a bigger serving is even better. 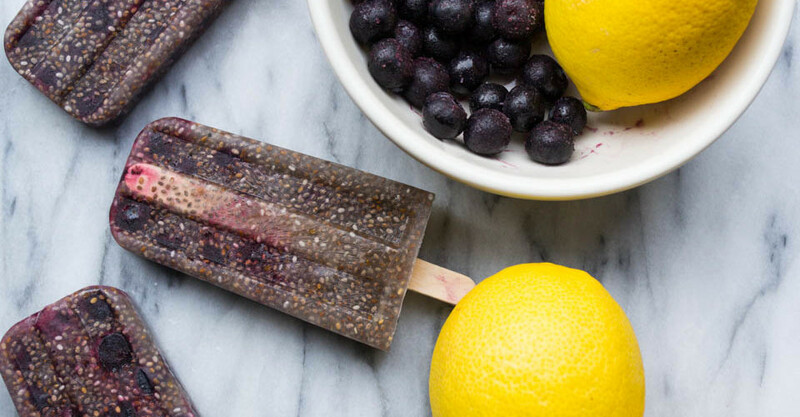 This month I decided to go with a more refreshing lighter popsicle than a creamy more calorie laden one. If you are a regular reader than you probably have noticed that I have cut way back on my posting of desserts and high calorie snacks. I’ve been able to keep it in check pretty well the past couple of months. It hasn’t been easy, I love to bake and create dessert recipes. 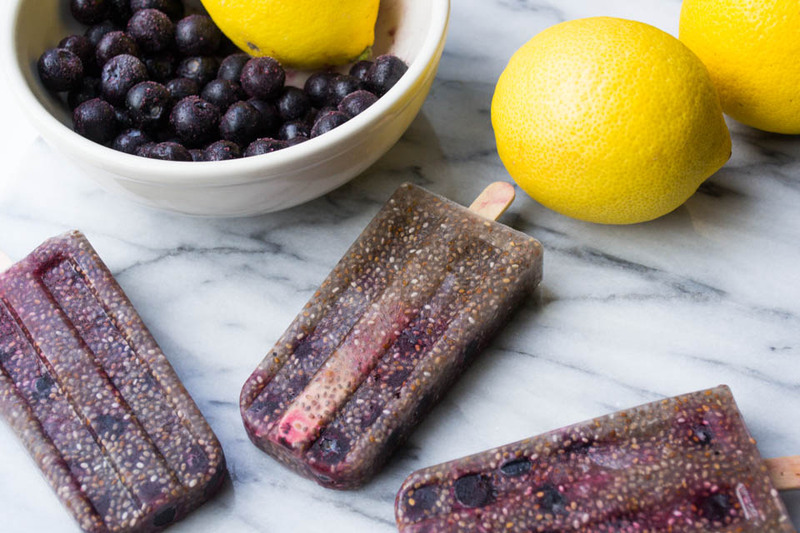 So for my popsicle for the month of May let me introduce to you the Blueberry Chia Popsicle. I’m kind of on a chia seed kick lately and there are so many good reasons why. Chia seeds are so good for you and have so many health benefits. They are extremely high in Omega-3’s which help with inflammation and unlike flax seeds they don’t have to be ground up to receive their benefits. They make you feel full, because they absorb so much water, which can help you with weight loss and hydrate the body too. They are rich in antioxidants even more so than flax seeds. I’m not dissing on flax seeds, which have many healthy benefits too. They are high in fiber, which also helps reduce inflammation, and for most of us that’s a good thing. They also provide calcium, zinc, and a few other beneficial minerals. 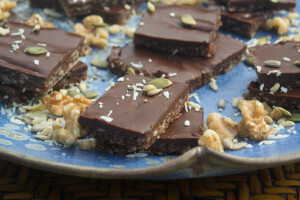 They are gluten and grain free, which makes them fit into so many allergy or intolerant eating lifestyles. Chia seeds also make a great replacement for eggs in baked goods. Chia seeds also help with insulin levels and lower the bad cholesterol, thus helping diabetes and hypertension. Who would have thought that these teeny tiny little seeds that used to be only sold as a way to grow a green pet in a terra-cotta dish shaped like an animal, would turn out to be such a way to add nutrients to so many dishes such as cereal, yogurt, salads, smoothies and yes even popsicles. I’m even going to add it to the feed of my chickens because it makes their eggs rich in omega-3’s. So don’t feel like you are indulging too much when you whip up these Blueberry Chia popsicles, because I believe the nutrients of these make them a very healthy alternative to a calorie laden dessert. Enjoy! Into a 4 cup measuring cup mix together coconut water, lemon juice, and maple syrup. Add chia seeds and let sit for 15 minutes, stir occasionally. In popsicle mold place blueberries into mold filling half way up. Pour liquid mixture half way into each mold, stirring in between to keep chia seeds mixed up. If you have any liquid left over divide it between all the molds. Add more blueberries, pressing down. Put lid on and add your popsicle sticks. Put in freezer to freeze overnight.